2003 Le Mans 1000 KM Race Poster. 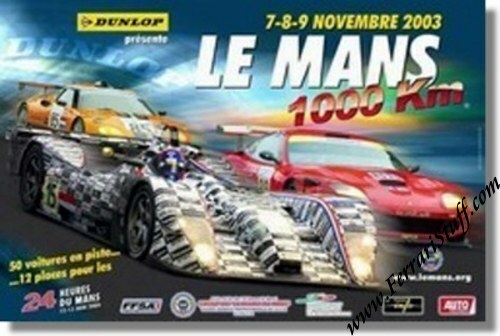 This poster is for the 1000 KM race held at the Le Mans track on November 7, 8 & 9 2003 and which served as a pre-qualifying event for the 2004 Le Mans 24 Hours race. The poster prominently features the Racing for Holland Dome, a ProDrive Ferrari 550 Maranello and the Spyker C8 Double 12R. It measures approximately 40 x 53 cm or 15.5 x 21 inches. Mint condition and very scarce.